Penny trained as scientific illustrator working as a botanical illustrator at Kew Gardens for several years before turning to sculpture. 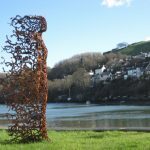 She is largely self-taught as a sculptor, creating her unique method of working with aluminium wire and resin and welded scrap metals. 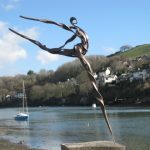 She creates fluid, dynamic sculptures expressing movement using the ebb and flow of the raw materials as well as the elemental forces of wind and sun, which interact with her work. 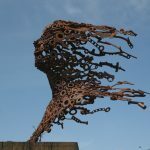 The ‘wind blown’ pieces convey a sense of Penny’s personal journey through all that life brings to us. 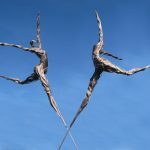 Created from welded scrap metal, these half-mythical figures use the elemental force of wind through time, as it alters and re-shapes our emotional and physical state. The kiss is her largest work today, life size and modelled on two figures it is a development from her earlier figure She Blew Me Away. 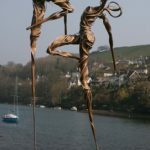 The Original You Blew Me Away was made in 2008 as part of an artist-in-residence at the Plymouth College of Art. Following its exhibition it was selected for the Autumn open exhibition at the Royal Western Academy in Bristol. 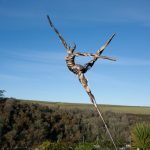 In 2013, a solo exhibition of Penny’s wind blown work at Highcross House, Dartington comprised a further five new works. 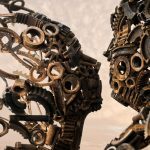 Penny describes The Kiss as waiting to happen, pressing to emerge after the individual, powerful creation of You Blew Me Away. 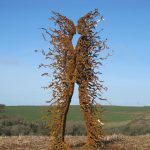 The Kiss is a joint expression of shared energy and emotion, unable to be contained between the two, exploding outwards to meet the elemental forces of nature together, resilient and strong in their passion’, explains Penny. 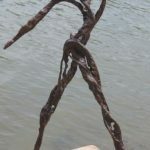 Her sculptures have a vitality and energy, with an intrinsic visual interest that intrigues and captivates. 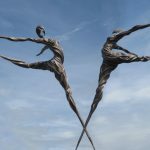 The dance sculptures sway in the lightest breezes, moving with the ease and grace of a dancer. 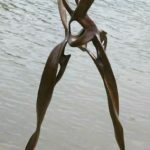 The ‘wind blown’ pieces convey a sense of Penny’s personal journey through all that life brings to us. 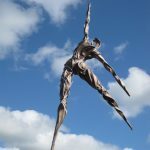 Created from welded scrap metal these half-mythical figures use the elemental force of wind through time, as it alters and re-shapes our emotional and physical state. The wind blown pieces have been sold all over the world including Texas, California, the Netherlands and Hampshire.